Nate Sudfeld is technically No. 3 on the depth chart right now. In one of the most talented quarterback rooms in the NFL, Nate Sudfeld is kind of a back up quarterback in waiting. Waiting, like he did last season, for an injury to boost him to second banana. Or, perhaps, for a Nick Foles trade to make him Carson Wentz' primary back up. 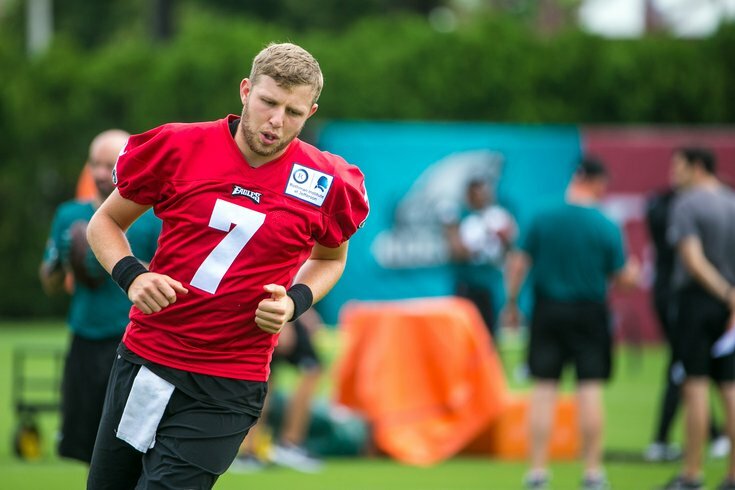 "We are all competing with each other trying to have the 'dime of the day' or the throw of the day or the best completion percentage of the day," Sudfeld said of sharing his position with Wentz and Foles. "As healthy as the relationship can be, it is. There is competition but it doesn't come through our friendship or anything." Every day, Sudfeld has an intimate look inside one of the more interesting situations in the entire NFL. A reigning Super Bowl MVP is slated to back up a guy in Wentz who Sudfeld says "should have won MVP" last year during the regular season before he tore his ACL. In addition to having two quarterback BFFs, Sudfeld is also soaking up all he can like a sponge. "It's an interesting dynamic, Sudfeld said, "but it's a testament to the guys in there... Nick, you've seen him in interviews, that's who he is. He is as humble as he can be. It's not about him and when he has this success, it makes you so happy for him." "That guy, he's just been so determined and relentless in his recovery, it's been a pleasure to be around. Off days, I'll come in and get some work and Carson's in there sweating. I think the world of Carson as a person and a player and he's going to come back sooner rather than later." Recently signed veteran wide receiver Kamar Aiken has seen his share of quarterback rooms during his time with the Bills, Patriots, Ravens and Colts and is taken aback by the talent and chemistry he sees on the Eagles. "Never have I ever," Aiken said. "In my eyes — it's a great situation to be in, just to know whatever guy is back there is going to be great." Sudfeld got a chance to play some meaningful snaps — well, relatively speaking — when he completed 83 percent of his passes against the Cowboys in Week 17 last season (after Philly had clinched its No. 1 seed). He's back with the team and has gotten votes of confidence from a front office that sees him as the future back up for Wentz after Foles eventually departs. "Between last year and this year I can't thank them enough for how much they've invested in me," the QB said, "how much I learn from being around them, it's a great situation. But at the same time, everyone wants to play and hopefully I get an opportunity to play myself." In the meantime, the competition continues. "We are in the beginning stages of our competitions," Sudfeld said, when asked whether the quarterbacks (fourth stringer Joe Callahan included) would engage in another heated ping pong tournament. "I will have more answers for you in a week. We were rolling a ball, playing golf sort of, rolling ball into a trash can 50 yards away, I think Nick won but Day 1 was just a learning day, it didn't count in the actual standings."